Given that they are all within a few hundred bucks of each other—and represent an incredible value—which do you choose? That’s a hard call, honestly. I’ll admit being a bit predisposed toward the Roland, mainly because I really like their products and I have a great relationship with them. I think it’s well-made, offers a great feature set and has the best iPad integration of any mixer on the market, large or small, by far. If it sounds anything like the other V-Mixing mixers (which I expect it to), it will sound quite good. It’s easy to use, and integrates well with other REAC-based devices. On the other hand, it’s the most expensive, has fewer mix busses than the X32, fewer effects options and REAC is limited to 40 channels, which is starting to feel tight by today’s standards. Still, if someone told me I had to mix on one every week (assuming my band would fit) I would not be disappointed at all. 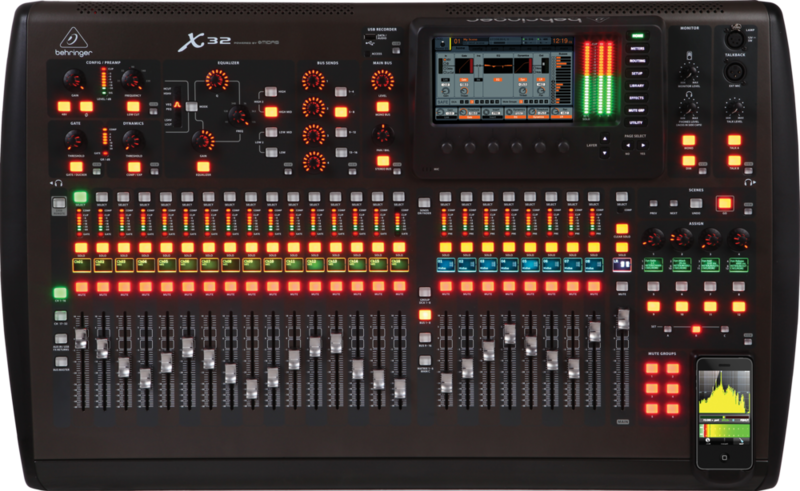 I really want to like the X32. I was very impressed with the feature set and UI when I saw it at NAMM last year, and my friend Andrew Stone says it sounds really good. And he’s not an easy guy to impress. 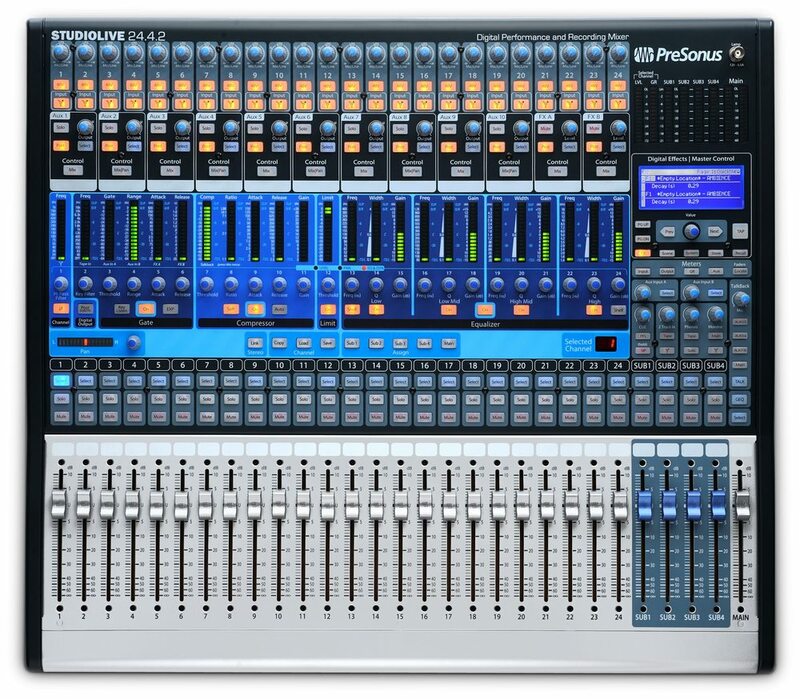 It offers more mix busses and FX options than boards that cost 3 times as much, and it has flying faders. It’s also the least expensive of the bunch, and you can add Klark Teknik preamps to it. But the iPad app is a pretty weak effort and you have to get past Behringer’s reputation. Will this one hold up better given the new association with Midas and Klark? A lot of people haven’t forgiven the sins of the past when they would simply buy another manufacturer’s product, take it apart, copy it exactly (down to the typo’s on the main board) and sell it for half price. It could be a great value, but who wants to be the guinea pig? The StudioLive 24.4.2 seems like the old dog in this race, though it’s only been out for a few years. I know a lot of guys who really like it, but I can’t make myself fall in love with it. I don’t like the Fat Channel layout, I miss VCAs, I don’t like their menu structure, and the lack of flying faders at this price point is hard to justify anymore. However, with their QMix iPhone software, everyone can mix their own ears (albeit mono), and the iPad app is quite nice. The FireWire integration is nice, and it’s a great way to get into virtual soundcheck and multitrack recording. For more inputs, you can cascade two of them and have a 48.4.2 mixer at a decent price. It all depends. In many ways, any of these could be a great choice for your church (or club, or school, or tour). The choice will ultimately come down to what you value, what you like and what compromises you can live with. At this price point, some things have to be cut. You have to decide if you can do without the things that were cut out of each mixer; and the good news is each one cut something different, so you actually do have options. The positive side of all of this is that we live in an amazing time. When I was starting my career as a church sound guy 20+ years ago, our options for small, affordable mixers were little mixers made for remote broadcast trucks or the Mackie 1604. If anyone would have dropped off any of these mixers at my church back then, I would have believed the rapture had occurred and we were all in heaven. Sure, each has limitations, but come on; at under $3500, any of these is a steal.